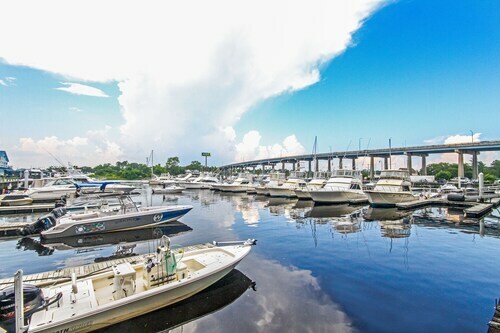 Located next to a sandy beach, Avista Resort is close to Cherry Grove Pier, La Belle Amie Vineyard, and the shops and restaurants of Barefoot Landing. Myrtle Beach State Park is a short drive away. 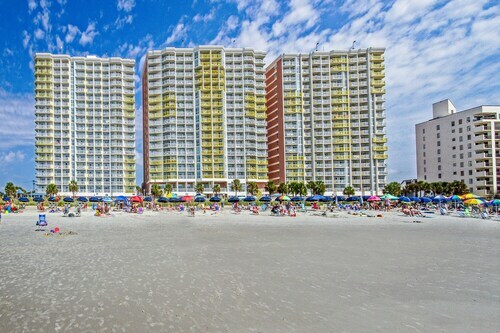 This beachfront condominium resort in North Myrtle Beach is 3 miles from the Carolina Opry's variety shows and Pirates Voyage Dinner Attraction, and 9 miles from Myrtle Beach Convention Center. Nestled on the beach, this North Myrtle Beach hotel is within 1 mi (2 km) of Carolina Vineyard Winery, Barefoot Landing, and Alabama Theatre. House of Blues Myrtle Beach is 0.9 mi (1.5 km) away. 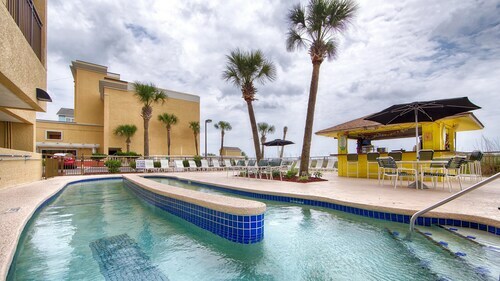 Nestled on the beach, this North Myrtle Beach hotel is within 3 mi (5 km) of Beachwood Golf Club, Barefoot Landing, and Alabama Theatre. House of Blues Myrtle Beach is 2.9 mi (4.7 km) away. 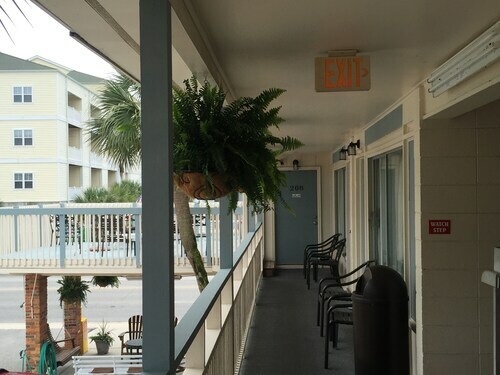 Located in Ocean Drive, this motel is 0.4 mi (0.6 km) from OD Pavilion Amusement Park and 2.8 mi (4.5 km) from Cherry Grove Pier. McLean Park and Beachwood Golf Club are also within 2 mi (3 km). 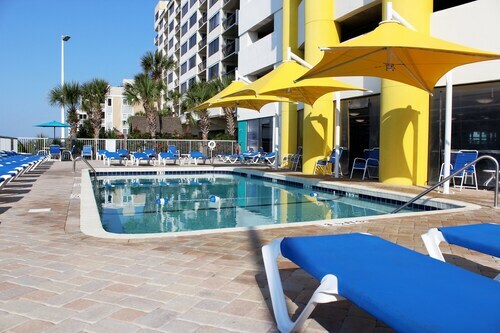 With direct access to the beach, this North Myrtle Beach hotel is within 3 mi (5 km) of Professor Hacker's Lost Treasure Golf, Barefoot Landing, and Alabama Theatre. House of Blues Myrtle Beach is 2.7 mi (4.3 km) away. 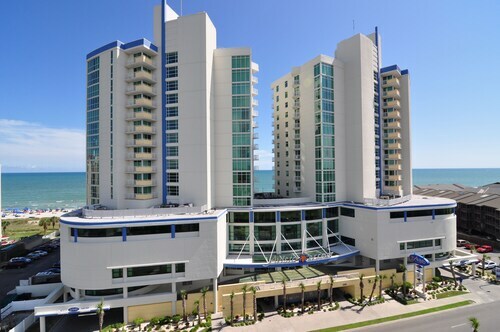 Situated in the suburbs, this hotel is 0.7 mi (1.2 km) from Molten Mountain and 2.6 mi (4.2 km) from Cherry Grove Pier. Mayday Golf and Surf Golf and Beach Club are also within 2 mi (3 km). 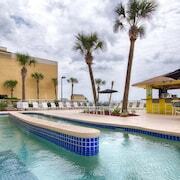 This secluded hotel in North Myrtle Beach overlooks a tranquil beachfront, just 2 miles from the shopping, dining, and entertainment of Barefoot Landing. 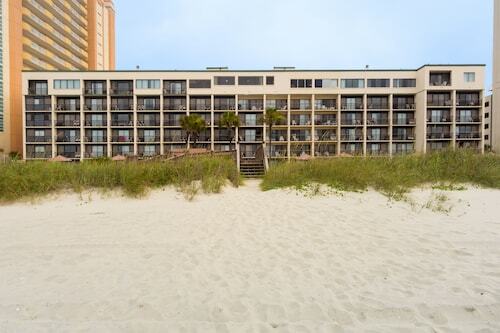 How Much is a Hotel Room in North Myrtle Beach? 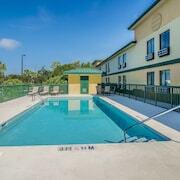 Hotels in North Myrtle Beach start at $71 per night. Prices and availability subject to change. Additional terms may apply. South Carolina’s “Grand Strand” is 60 miles of pure, spotless beaches and lighthearted gaiety reminiscent of bygone days. 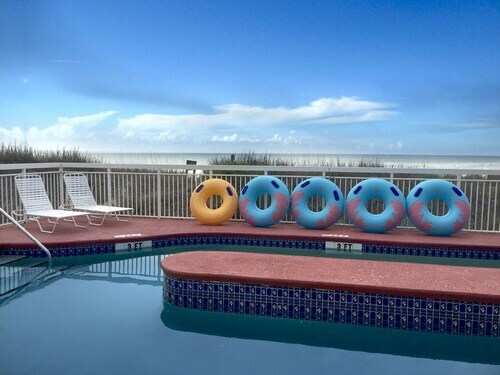 At the heart of it all are hotels in North Myrtle Beach, SC, home to the region’s only oceanfront amusement park—and so much more. Gentle ocean waves lap at the sand, ready to transport you back to the simpler times of childhood. But do not get too lost in your daydreams, dear traveler. There are plenty of incredible new memories waiting to be made. 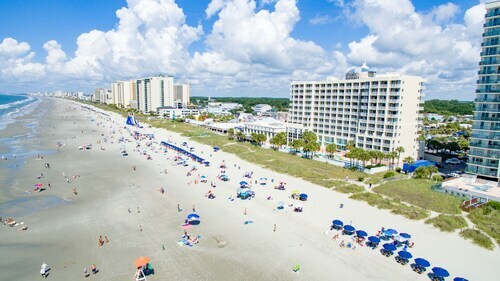 Listen carefully as you check into North Myrtle Beach hotels and you just might hear the roar of roller coasters and cheerful shouts of delight from nearby Ocean Drive Pavilion Amusement Park. Let the scents of classic fair foods like funnel cake and corn dogs guide you toward this oceanfront play place. Indulge your taste buds for a moment or two, then leave earthly cares behind as you take in spectacular views of the Atlantic on the Ferris wheel. You can also enjoy savory bites at the restaurants along Main Street or Kings Highway, where you’ll find family-style dining and fresh seafood shacks. Savor crunchy calamari and butterfly-cut shrimp dipped in delectable sauces or dive into buckets of clams and oysters. Wash it all down with an ice cold pop, and you’re ready to retire to the beach. 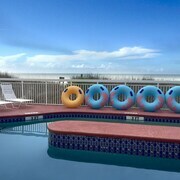 If you have booked rental cars in North Myrtle Beach, you can easily make your way to pristine spots in the south of town. Dig your toes in the sand near the Second Street Pier or recline with a rum punch on the promenade without getting a single grain in your shoes. 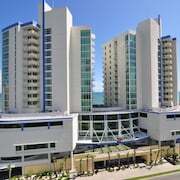 Just be sure you’ve booked Myrtle Beach hotels before you order up a second one. 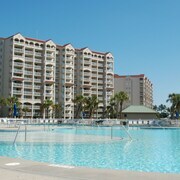 Start creating memories to last a lifetime with Travelocity’s great deals on cheap hotels in North Myrtle Beach. We would also recommend a rum punch while you browse, but that is up to you, wise wanderer. It just might help you fully imagine how wondrous your upcoming trip will be. 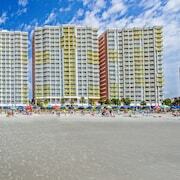 Need insider tips on must-see attractions in North Myrtle Beach? 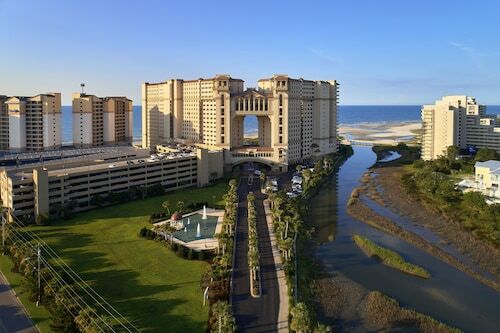 Check out our North Myrtle Beach travel guide! Everything was great! Room was nice, staff was friendly....I would stay here again. Quick check-in at an excellent rate. Room was spacious however mattress was somewhat lumpy. In good condition. No issues. Accessible to various attractions.